This commentary is designed to render Plutarch’s Marital Advice immediately accessible to intermediate readers and to facilitate the swiftest reading possible. Notes, which are kept intentionally brief, succinct, and devoid of historical, literary, and cultural explanations, serve alternately as glosses for uncommon words and idioms that the undergraduate reader will not be expected to know and as concise grammatical and etymological helps. 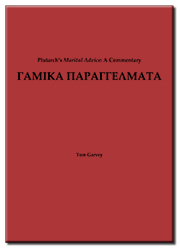 The present edition is designed to aid the intermediate Greek student to read Plutarch’s Marital Advice in the original language as effortlessly as possible. In addition to the following text and commentary, students will need only a standard dictionary and a copy of Smyth’s Greek Grammar—both tools that most intermediate students will already possess.